Paloma Instantaneous water heaters water only when you need it. With Paloma Tankless units there is no standby heat loss. Paloma Tankless water heaters run continuously. That's right, endlessly. 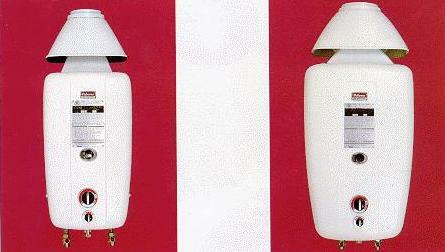 Paloma Tankless water heaters are compact, hang on the wall and that saves valuable space. Tank systems waste precious costly fuel by keeping the tankful of water constantly heated. This produces higher fuel bills. With tank heaters when you run out, you wait for another tank full of hot water. Not with endless...you never run out of hot water. Just one PALOMA supplies all the hot water you need in your home for shower, bath, dishwasher, laundry, etc.... heavy simultaneous use may reduce the flow at a particular faucet. The Ph12 is typically for one shower running at a time, the Ph24 is for two showers running at the same time. Review the spec sheet for the gallons per minute each model produces or send email and let us know your home water heating needs. Save dramatically on your current water heating bill. Storage-type hot water heaters lose heat all day long (and all night too!). They consume more energy than any other job in the home except space heating. Palomas heat only the water you need as you're using it. You never store hot water again. You never wait for water to heat up again. You never run out of hot water! 5-year limited warranty on heat exchanger leakage 3-year limited warranty for all other parts. * Warranty for commercial use, ask Paloma dealer. a. In small, poorly ventilated rooms. b. In air-tight rooms with air-conditioning. c. Near vents for heating or cooling. d. In places where chemicals are used. e. In bathrooms, bedrooms or any occupied rooms normally kept closed. f. In a location where heater may be exposed to freezing temperatures. h. In Recreational Vehicles, Mobile Homes, Boats and other Watercrafts. I. As a part of any Circulating Systems. (such as Home Heating, Spa or Pool Heating, Recirculation to the other Tank, etc.) In corrosive, dusty and greasy environments. The advanced burner design of the Paloma tankless water heater prevents fowling, insuring peak output at all times. Burner deterioration is eliminated due to solid stainless steel construction. Scaling and mineral deposits are prevented by vortex wiping action and high velocity of water in heat exchanger. PH-6DN/DP, 12M-DN/DP, 24M-DN/DP ARE DESIGN CERTIFIED BY A.G.A. PH-6DN/DP, 12M-DN/DP, 24M-DN/DP ARE DESIGN CERTIFIED BY C.G.A. APPLICATIONS: The Paloma Portable Water Heater is a must for the serious horseman. This completely self contained unit, mounted on a dolly, can be easily transported to horse shows, races, or anyplace else hot water is needed. Simply attach a garden hose for an endless supply of hot water. The Paloma tankless water heater is indispensable on farms for cleaning, heating calf water, mixing feed, and in milk parlors. This safe and economical water heater will pay for itself over and over again. Paloma water heating systems are also being installed by business owners in washrooms, car wash establishments, restaurants, laundromats, nursing homes, etc. We offer advice on model selection based on individual need and water flow desired. Paloma, designs and installs customized water heating systems that will handle virtually any water heating need. Five heater models are available, up to 178,500 BTU per hour. Who would use Paloma Gas or Propane Tankless Water Heaters? Milk Parlors, Restaurants, Green Houses & Nurseries, Residential Homes, Vacation Cottages and more!